The UCLA Edward A. Bouchet Graduate Honor Society (Bouchet Society) recognizes outstanding scholarly achievement and promotes diversity and excellence in doctoral education and the professoriate. 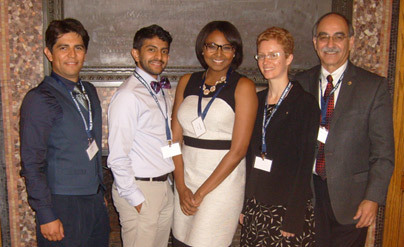 The Bouchet Society seeks to develop a network of preeminent scholars who exemplify academic and personal excellence, foster environments of support and serve as examples of scholarship, leadership, character, service and advocacy for students who have been traditionally underrepresented in the academy. In the spirit of Bouchets commitment to these pursuits both within and without the academic realm, inductees into the honor society bearing his name should also exhibit these qualities. Teniope Adewumi-Gunn is currently a doctoral candidate in the Environmental Health Sciences department at UCLA Fielding School of Public Health. Teniope’s research interests include applying industrial hygiene to under-served worker communities, sustainability, and environmental policy. She was previously the Environmental Justice Research and Policy Analyst for Black Women for Wellness, where she used her industrial hygiene skill set to engage community members to influence local, state, and national level policies that regulate the safety of chemical use in cosmetics and personal care products. She is a Switzer Environmental Fellow, Women’s Policy Institute Fellow, Board Chair of the Associated Students UCLA, Past Chair of the American Industrial Hygiene Association Student Local Section Council, and past member of the Board of Barbering and Cosmetology Health and Safety Committee. In addition to numerous awards for her health and safety work she was named a Radiant Woman of Action by Radiant Health Magazine. Her work has been featured in HuffPost Live, Cosmopolitan, Essence Online, Atlantic CityLab, Think Progress and more. She completed her Bachelor of Science in Health Sciences at California State University, San Bernadino and her Masters of Science at University of California Los Angeles (UCLA). David was born in Monterrey, Nuevo Leon, Mexico, and raised in rural southeast Texas. He became a naturalized US citizen in 2009. David began his academic journey as a community college student at Moorpark College, eventually transferring to UCLA and graduating with a B.S. in Chemistry and a minor in Atmospheric and Oceanic Sciences. David is currently a Ph.D. candidate in Atmospheric and Oceanic Sciences at UCLA. His research is focused on the atmospheric chemistry of particulate matter pollution and how it relates to human health. His current research investigates how damaging radicals are produced from air pollutants dissolved in lung fluid, with a focus on wildfire smoke. He hopes his research will provide chemical metrics for regulation of particulate matter pollution. David is a strong supporter of public science literacy. He hopes to educate the public on science through teaching and public outreach. As a member and co-president of UCLA’s Organization for Cultural Diversity in Science (OCDS), David helps give presentations that inform underrepresented community college students on transferring to university and applying to graduate school. David maintains a passion for chemistry, teaching and inspiring others. After graduate school and postdoctoral research, he hopes to enter the world of policy advising and maybe run for office. Devon Graves is the 2018-19 Student Regent. He is a student at the University of California, Los Angeles, Graduate School of Education and Information Studies working towards a doctorate degree in Higher Education and Organizational Change. Mr. Graves is a proud product of the California public higher education system and is the first in his family to graduate from college. He has been heavily involved as a student leader. He has served as Attorney GTeneral for the Cal Poly Pomona Associated Students, Inc. (ASI), and served two terms as the Chair of the California State Student Association (CSSA), the recognized statewide advocacy group for the 465,000 California State University students. Mr. Graves has also served two terms as a gubernatorial appointee on the California Student Aid Commission. He also served as the primary negotiator representing student consumers in the United States Department of Education negotiated rulemaking process fro the Title IV Loan Issues rule making. Mr. Graves’ research focuses on community college students’ experiences with financial aid. He is committed to the student of higher education and wants to research different financial aid programs to ensure that students have all the tools they need to understand the cost of college, take advantage of all financial aid opportunities, and select the college that best suits them. Mr. Graves received his B.A. from Cal Poly Pomona and his M.A. from UCLA. Portia is a California native and grew up in a foster home in Merced, CA. She received her A.S. in Chemical Sciences from Merced College (2011), B.S. in Biological Sciences from UC Merced (2013) and Ph.D. in Quantitative and Systems Biology from UC Merced (2018). Portia is currently a UCLA Postdoctoral Longitudinal Investment in Faculty Training (UPLIFT) Fellow. Her research focuses on microbial evolution and antibiotic resistance. She is currently serving as the Chair of Community Engagement of the UCLA Postdoctoral Association, in which she hopes to strengthen and help connect UCLA’s diverse postdoc community through a variety of social and family events. Most importantly, she is a mother of three (8-year old daughter Briana, 3-year old son Andres and adopted 1-year old nephew Jayden). She understands the challenges being a parent in academia and the importance of having a sense of community. Being married to a Hispanic spouse and raising bilingual children ingrains the need to be as inclusive as possible and emphasizes the importance of understanding diversity. Jennifer Pierre is a doctoral student in the Department of Information Studies at UCLA, pursuing research in the areas of computer-mediated communication and social informatics. Her work broadly examines how people use information and communication technologies (ICTs) to form and maintain communities. Specifically, she studies how youth and other groups use social media for participation and social support, and how various individuals and communities use data to facilitate communal activism and social change. Jennifer’s dissertation explores the intersection of social media and social support for at-risk youth, within the context of after-school and summer youth development programs. In this and previous work she has used a variety of qualitative and mixed methods, including ethnography, content analysis, statistical analysis, semi-structured interviews, and surveys. Her work has been published in Big Data & Society and the proceedings of HICSS and iConference. Additionally, Jennifer’s research has been recognized through awards and fellowships from the Ford Foundation, ACM SIGCHI, and the UCLA Graduate Division, among others. In addition to her research experience, Jennifer has extensive professional and service experience in social media management, instructional design, and diversity and equity related issues. She has M.L.I.S. with a specialization in Informatics from UCLA, and a B.S. in Communication with concentrations in Information Technology and Psychology from Cornell University.